EXMO Crypto?urrency Platform has announced that the start of the EXMO Coin (EXO) crowdsale will be pushed for two months. The team’s decision was caused by the rapid expansion of business, and the necessity to postpone the introduction of margin lending on EXMO platform. The update concerns the crowdsale dates exclusively, while the rest of terms and conditions remain as previously stated in their White Paper. 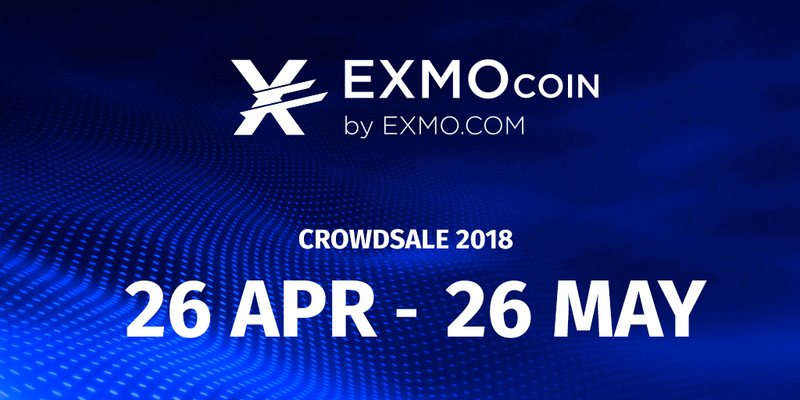 The new EXMO Coin crowdsale timing is April 26 — May 26, 2018. It has been two months already since EXMO Coin crowdsale was announced. We at EXMO are used to taking actions based on thorough calculations and analytics, nevertheless, even our experts could not predict such a high public interest in the EXO token. The quantity of requests to participate in the EXMO Coin crowdsale has exceeded all our forecasts by 3 times. Starting from November 2017, at least 10k new users have been registering on EXMO exchange daily. Around the New Year 2018 time the number of closed deals on the platform has seen a 9 fold increase from that just two months ago. The number of those wanting to use margin lending has also grown significantly. Based on our marketing surveys, 6 times more users are expecting the new service to be launched on the platform than in October 2017. Needless to say, such an active growth has pleased us greatly, though it made us reflect on the availability of the required resources. If initially we had enough of them to run margin lending with a triple reserve, now, with the current trading volume and demand, we require some time to prepare them. According to our estimations, we will launch the public version of margin lending with the maximum efficiency in March 2018. Prior to that, we will focus on resource development, as well as the closed service testing. Unfortunately, the update on the crowdsale may appear with delays in other sources. To stay up to date with all the relevant information about our project sign up to the official EXMO Coin channels: EXMO Coin newsletter, Telegram, and Facebook. In case of any questions do drop us a line via ExmoCoinChat. You may learn more about the EXMO Coin crowdsale and EXMO on the company’s official website, Twitter, Telegram, and Medium.